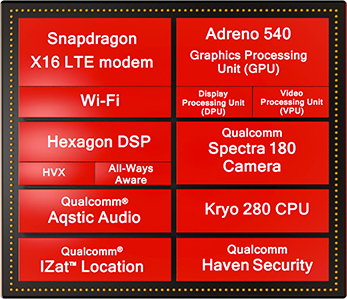 The Qualcomm Snapdragon 835 Mobile Platform (MSM8998) is a high-end SoC for smartphones (mostly Android based) that was released early 2017. Its one of the first processors that is manufactured in 10 nm (LPE FinFET at Samsung). The SD835 is the successor to the Snapdragon 821. It integrates 4x Kryo 280 at 2.45 GHz (max) for performance and 4x Kryo 280 at 1.9 GHz (max) for efficiency. Furthermore offers an X16 LTE modem, 802.11a/b/g/n/ac/ad WiFi, a dual-channel 32-Bit 1866 MHz LPDDR4x memory controller, an UFS 2.1 controller, Hexagon 682 DSP, Spectra 180 Image Seonsor Prozessor, Bluetooth 5.0, GPS, GLONASS, Baeidou, Galileo Satellite Support.